0 Comment May 18, 2017 Like? This week, we review the new OSD Menu control over IP. This was an extremely popular request from our user base so we built it into the Gen 2 SDI Models. The ability to quickly access the cameras OSD menu over an IP connection allows users to access every feature including: Wide Dynamic Range, Iris, Focus, Luminance, Contrast and much more remotely. Keep in mind this feature is ONLY available for Gen 2 HD-SDI models. If you have a Gen 2 HD-SDI Model you may need to upgrade your firmware. Please contact [email protected] for instruction on updating your firmware to add this new feature. Hello everyone, welcome to our “Secret of the week” number two. This is been a feature that what been waiting for so long and lot for our customer have want the ability to control every single feature of the camera over an IP connection. So if you’ve got this camera, thousands feet away but you do have access to it over an IP network on your local area network via your static IP address or anywhere in the world really, with the virtual private network connection to that network. You can control every single feature of our PTZOptics camera’s. And I’m going ahead and show how that works. First of all just briefly to show you what’s going on here, we are connecting over a network browser. So your camera connecting to the network, your computers connecting to the network. And were typing in the IP address of the camera and we’re going to control every single feature of the camera. So let me go ahead and show you what’s this going to look like. First of all this is the IP address that I type in to my web address. And now you’ll find that there’s a new feature. You can either have the PTZ mode or OSD mode. So I want to do, I want to show you what happen when we go to OSD mode, this is the live camera feed here. When you go on OSD mode it pulls up the onscreen display menu. So that will be displayed on the camera output, whether its HDMI or HDSDI or the IP stream, you will be able to see that. Now it give us the ability to go ahead and scroll you of the functionality of the camera. For example, the exposure I am shooting some type of [00:01:52] a home bottom center by the way. I’m shooting at outdoor and the exposure need to change in auto to possibly manual. What we can do here is we can go in and adjust the iris, maybe open up the iris little bit or, we can change the shutter speed or. For example, one or my favorite example, let say the lightening changes in some back lightening. And we want to increase the wide dynamic rage, we call that DRC (Digital Rage Control) I just want to bring that up a couple clicks. So that we can compensate that background lightning. So the back bottom down here, a larger to get back a level, and then the home bottom a larger to go forward a level. So if you need to change your color a little bit, if you need to adjust the image a little bit and, adjust maybe the luminance, maybe turn it down a couple, couple clicks. You can do so very easily right over this network port. So I’m going to show you every single detail. I’ll go in each menu just for the heck of it. Speed by zoom, all of this things, fast zoom, digital image freeze, things like that. We can go into the noise reduction, let say it’s getting a little dark out and now we need to turn up the noise reduction a little bit. Because we’re getting a little bit of game. We’re going a little bit of pixelation, that actually helps a lot. And then finally, let say we need to do a little remote set up. I could see this features being used for people setting up system in the field. We can go ahead and change our mode in DVI mode is actually allows us to change whether we want to embed audio over the HDMI . And our communication set up again I can definitely see this being use. Let’s say we want to change our protocol or visca address of the camera that can OP done over the network. And then to close it, we just go back to PTZ mode. And now these bottoms allow us to control the camera. So you can see here that now I’m controlling the camera as oppose to altering the onscreen display menu when I am in this mode. Cool! 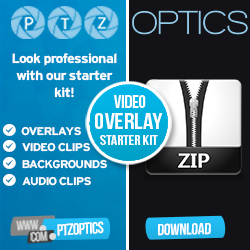 Click to watch another exciting PTZOptics video. And don’t forget to subscribe. Tune in Friday on 11am pacific, 2pm eastern to join our live show. With new industry expert interviewed every week.